Back to the archives today as we take a look at another tram from Blackpool with this edition of Picture in Time featuring Blackpool Brush car 627. Built in 1937 the tram originally carried the number 290 until the 1968 renumbering scheme saw it take the number 627. 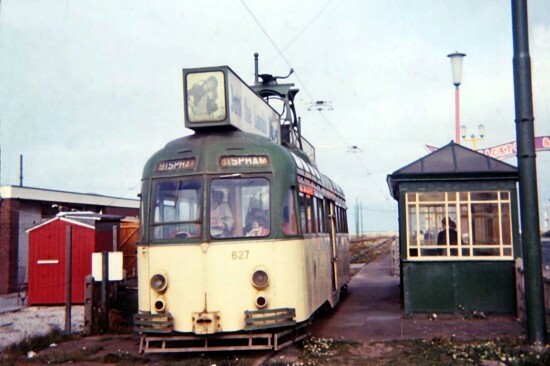 As 290 the tram was the historic last car to operate on the North Station to Fleetwood route in October 1963 and following the closure of the route it continued to operate on the remaining Prom route until it was finally withdrawn from service at the end of the 2004 season. A brief return to service did follow for one night only during the Farewell to Fleetwood tours in November 2009 but following that it was back to obscurity once again. Acquired for preservation by the Fleetwood Heritage Leisure Trust it spent time inside at Kirkham Prison where it received a repaint into a special Diamond Jubilee livery ahead of display at Pleasure Beach loop for the 2012, 2013 and 2014 illuminations (featuring three different liveries including the infamous Inkie graffiti style in 2013). It was removed from Pleasure Beach ahead of the 2015 illumination season and was moved for further storage at Rigby Road Depot but remains in the ownership of the FHLT. In this photo we see 627 at Starr Gate in July 1972 with its twin destination screens set for a return journey to Bispham. As well as carrying the plain half green/half cream livery 627 also has roof advert boxes in situ. I seem to remember this having a slightly different interior set up to the others. Didn’t it have two extra bulkheads (one per saloon), something to do with it being the designated Driver Training Tram in the early 90′s. Only when in use as a trainer. I’m not sure what Mark means by ‘extra bulkheads’ but a ride I took on 627 in summer 2004 showed this car to be interesting around the platform area, being more original than other Brush cars then in service. It retained the internal access flaps to the former side destination screens – which I seem to recall flapped around uncontrollably as the tram rattled and vibrated its way along the then poor Central Promenade trackwork! – and I was particularly fond of the Alhambrinal (I presume) ceiling panel above the platform, painted over but still displaying an attractive streamlined pattern of beading rather different from those still retained by the most original Balloon cars, notably 715 and 717. Car 636 was regarded by many as the most original Brush car in service on account of retaining the external louvres above the windows (albeit no longer illuminated) but I checked this car when it was parked in Hopton Road at the September 2004 depot open day and it did not retain 627′s platform features. 627′s saloons had been modernised in similar style to other Brush cars which had received attention around the mid 1970s – 622, 623, 632, 634 etc – with the louvres and roof lights panelled over, this work clearly having been done later than the July 1972 photograph which shows the car in a much more original condition. So I got the impression that this tram was something of a hybrid with its comparatively unmodernised platform features which gave a hint of the glory of the Brush cars in their heyday, and it became my personal favourite Brush car for this reason. Despite apparently having missed out on the full rebuild granted most of its sisters, it remained one of the prominent members of the fleet due to its interior heaters, and I believe initially seemed to escape the 2004 end of illuminations ‘cull’ by a week or two! I was delighted when it was, somewhat ethereally, brought out for the last Fleetwood Ferry tour with Box 40 and Balloon 702 in 2009 after five years of disuse on account of being the last car into Bispham Depot on the North Station – Fleetwood route as car 290 in 1963. Although its interior was somewhat weary, it performed superbly which, as with the similarly revived car 679 the previous year, is a real testament to the quality of these 1930s cars. It was the most memorable tram tour I have ever experienced, Bryan Lindop giving a speech outside 627 in the dark stillness of Fleetwood Ferry terminus at around 1 o’clock in the morning, before a final run with 702 to the Pleasure Beach and a further bonus when 627, by then the last tram out, was delayed in returning to the depot as its pre-2004 point rod was apparently unable to operate the relaid pointwork on the promenade! As I recall, we rumbled along Lytham Road in fine style some time before 3 am, bringing down the curtain on the 2009 season before the winter tramway closure and earning car 627 a further place in the history books!